Looking for a colorful salad recipe that welcomes spring and is easy to make. 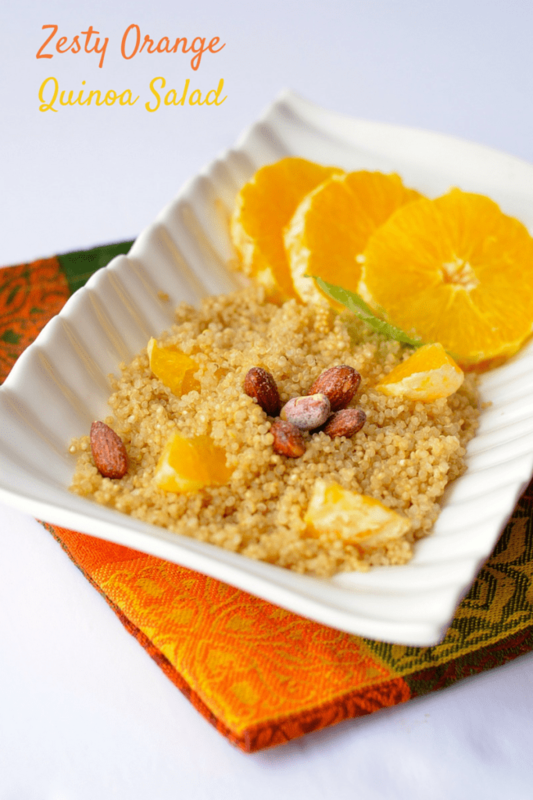 How about making this zesty orange and almond quinoa salad recipe! It is refreshing and so good. It is perfect for your lunch, dinner or those fancy dinner parties you will be hosting. Quinoa salads can sometimes be a little on the bland side. I find that I need to enhance them with either creative ingredients or seasonings. 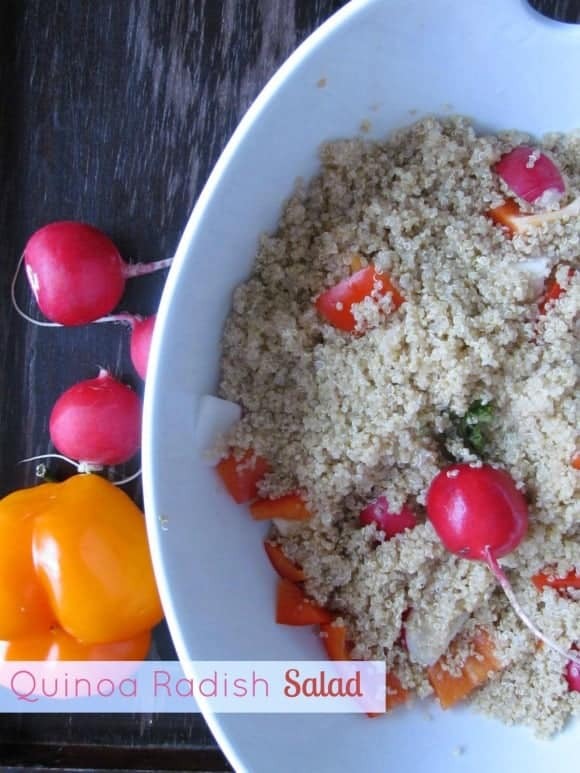 I tried this Radish Quinoa salad before and I loved. But eventually I got bored with it and wanted to try something new. Since I had some oranges on hand and almonds around, I figured I would mix them into my Quinoa as an experiment! It came out fantastic, so I’m sharing it with you! With just three ingredients, this quinoa salad recipe truly is an easy healthy recipe! 1. Cook the quinoa as per directions and let it cool. Cut the orange in half. 4. Season with the orange juice. Make sure to pour the juice slowly so you don’t completely saturate the quinoa. No one wants saggy quinoa salad, right? 5. Decorate with the slices of oranges. Of course, you can also eat those decorations! Voilà. It is a refreshing spring salad that will please most of the taste buds in your home. This is the perfect way to introduce quinoa to your picky eaters, too. 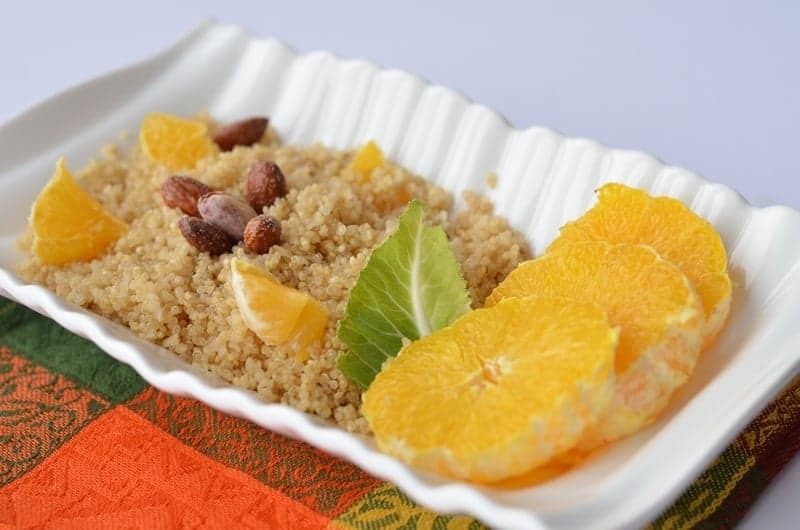 The orange adds a nice sweetness to the nutty flavors of the almond and the quinoa itself. Find more delicious spring recipes on our Pinterest board! What do you think of this easy quinoa salad recipe? Have you ever tried mixing quinoa with fruits? How did you like it. Share with us in the comments below! This sounds like such a refreshing salad,thanks for the recipe. This looks delicious, I’ll have to try it! This salad sounds delicious – and so perfect for my household of orange-lovers! Thanks for sharing. I will definitely be making this salad. I love the new twist on this side dish! This is a great way for me to get my kids to enjoy it too! I don’t know anything about Quinoa, thanks for the idea, i’d be searching more about it. I love quinoa! This looks so yummy! I have never had quinoa. I have heard great things. I will have to try this. oh that looks really good. I will have to check this out more!!! My brother has been into quinoa for a while now. I eat it too, but not as much as he does. I made a couscous salad similar to the one featured here. It was delicious, and I loved the addition of citrus. I’m actually not a fan of quinoa but man those oranges look great! wow, looks interesting! I bet it’s really good. I love quinoa flakes. Looks great! I have never had Quinoa. But that salad looks great. Fantastic! I love quinoa and I bet the citrus gives it a nice flavor. I’ll have to try this. This looks so fresh and spring-like! I bet it tastes great! That looks so refreshing with the oranges. I must, must, must try this recipe! I have not tried quinoa, this might be a good salad to try it out in! Thanks for the recipe. The salad look good. Thank you for sharing the recipe. I really enjoy quinoa. This sounds like such a refreshing salad! What is Cyber Bullying & How Does it Affect Your Kids?